SAXON isn't wasting any time in 2018. Following the critically acclaimed release of Battering Ram in 2015, the heavy metal giants are set to release their latest studio album, Thunderbolt, on February 2, 2018 via the Militia Guard label (Silver Lining Music). The new album Thunderbolt will feature original artwork by long time SAXON collaborator Paul Raymond Gregory. "This is album 22 and it's called Thunderbolt. It's a storming, smashing, thundering collection of tracks we've been crafting with producer Andy Sneap, and it's finished ready to be unleashed. Stand clear and fasten your seat belts!" says Biff Byford. "This is part one of the colossal Thunderbolt World Tour. We're going to be touring the whole of 2018 so get your tickets and join the ride. It's going to be fast and furious, dark and brooding. 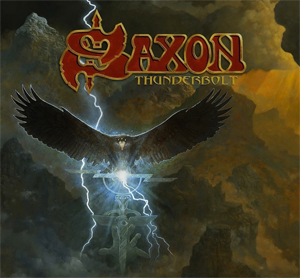 Monumental riffing and screaming vocals - loud and proud - it's going to be a SAXON tour, unique in every way!" adds Biff Byford.